Cort the Sport: What's your idea of a great Saturday morning? 5:00 am - wake up, coffee, breakfast, and GLORIOUS finish to 1000-piece puzzle!! HOORAY!!! 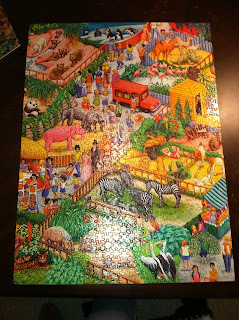 I loved this puzzle. 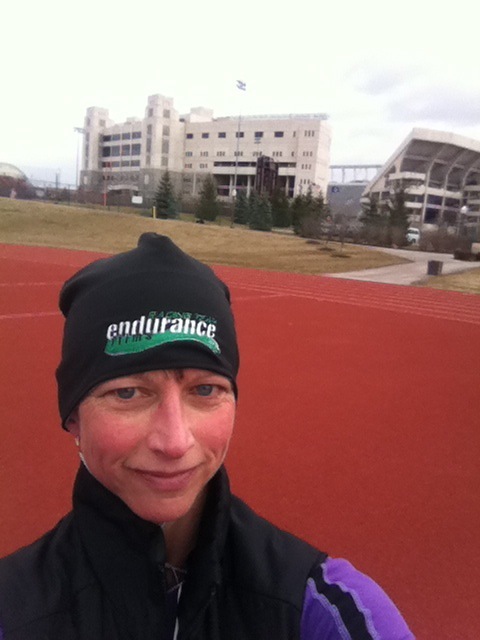 6:40 am - Hit the Virginia Tech track for my long run on a day with temps in the lower 20's and wind gusts up to 45 MPH. With the hip iffy, it just made sense (to me, at least) to go around, and around, and around the track for 18 miles rather than chance having an issue and being miles away from my car. Plus I didn't have to carry anything with me, I just set up a "pit row" for myself. 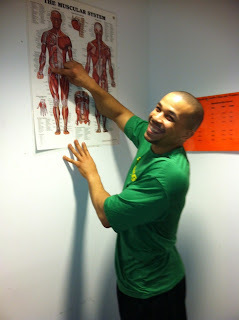 10:00 am - deep tissue massage work by Mario, shown here cheerfully pointing out my "problem" area!! 12:00 - lunch...leftover sesame noodles with added chicken courtesy of April Walsh. mmmmmm. 1:00 pm - getting ready to snuggle up with two kids and a dog (and maybe a cat or two) to watch either Apollo 18 or the Smurfs. I have a bad feeling it's going to be the Smurfs. I'll deal. And your idea of a great Saturday morning would be....?